This is a simple and quick way to enjoy a Thanksgiving favorite! Canned yams or sweet potatoes may be used. Place sweet potatoes in a medium baking dish. Distribute butter pieces evenly over the sweet potatoes. Sprinkle with brown sugar. Layer with miniature marshmallows. 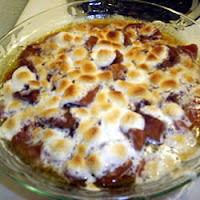 Cover and bake in the preheated oven 25 minutes, or until sweet potatoes are tender and marshmallows have melted.